It's my 4th time here in Oceanside. 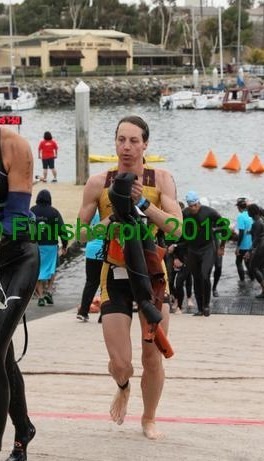 I was nervous fitting in a lot of things before the swim start including setting up 2 transition areas. But of course, the Lord always works things out beautifully. After setting up T2, Troy and I set up our team tent in the club area right by the finish line. We bike a mile to T1 where we squeeze our bikes onto the racks. Good news! The water temperature is around 63 degrees! Thank you Jesus! We were expecting mid 50s so this is good to hear! Troy and I still put disposable heat warmers in our bike shoes and on our aerobars just in case. We also have FCA race jackets ready to go as well. Oh, and the new secret weapon for fighting the chill for me (old to Troy) is an aero helmet. Will the aerodynamics help today as well? Well, I’m not too concerned about that but it’s a nice plus. Not much to do now except get on our wetsuits and find our waiting swim waves. I’ll have a 12 min lead on Troy. That’s a good challenge for him to catch me on the bike. Before we part, we pray and give hugs/kisses. “Catch me fast, Troy!” is the last thing I say to him. After weaving my way through a long crowd of athletes, I finally find my wave. I’m getting excited to start. I haven’t swam for over a week since we just spent the week at Disneyland and at my folks in San Diego. It will make me more tired coming out of the water but I have confidence that I will be fine…especially with Jesus with me the whole way. It’s finally our turn to swim out to the start. Oh, cold! But my face doesn’t shriek when I put it in the water so that's a good sign! I put myself on the front line, far right. Ready, set, go! I get a good start and it looks like I’m near the top group. The first 10 minutes is great. There are few swimmers from previous waves to dodge. I focus on pulling through on the stroke. 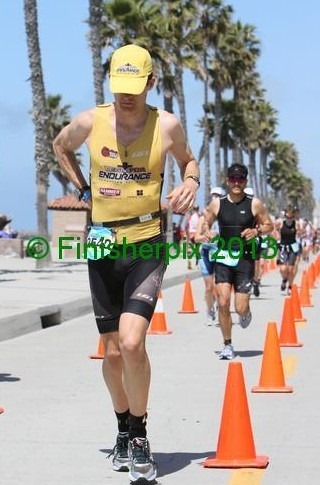 It’s hard to know where I am in my age group but I’m guessing near top 10. There is a girl with a gold streak on the back of her wetsuit and I try to keep her in my line of sight. I hope to catch her by the end. It’s getting more congested out here. I try to look up more often so I don’t run into anyone. But I have to keep my head down as often as possible to get a good rhythm…it’s a tough balance. The gold girl is still ahead but it seems like I’m closing in. I make the final turn and it’s time to head home. I’m finally gaining on her but also gaining on a lot of other waves. Suddenly a swimmer shoots by. Wow, the next wave behind us is here already?! I better get on his feet for as long as I can. It doesn’t last long and I’m soon watching his bubbles. Another guy goes by and I am able to keep up for a few minutes. Soon, I’m rounding the last corner and the finish line is ahead. The gold girl is not too far ahead…yeah! I’m happy with my effort and look forward to getting on the bike. The volunteers help me as I run out of the water. They unzip my wetsuit. “Thanks!” I pull over and take it off. It gets stuck at my feet but I get it off pretty fast and run to my bike. I struggle a bit putting on socks and jacket. I shove my swim gear in the race bag they gave us and run out of transition. Another struggle getting on my bike and putting on my shoes which are already attached to the bike. Finally, I’m off! Thank you Jesus! 56 Miles to go…it sounds daunting! A fifty-something gal flies by me. Wow! I catch her on the first hill and hope to stay ahead. We ride onto the Camp Pendleton Base. That gal flies by again and I watch her pull away. The warmers seem to be helping minimally in my shoes and on the aerobars. The warmers on my aerobars look like a female product and I want to drop them at the first aid station. Too embarrassing. 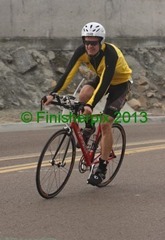 The jacket and aero-helmet has made the most difference keeping me warm…and accountable. With “Competing for Christ” on the back of the jacket and the FCA stickers on my helmet, I have to be a "light" and watch my conduct/attitude. Over the first 4 miles I see my average is over 19 and my cadence around 90rpm. I didn’t have a goal pace and I don't remember my fastest time here. But I hope to finish under 3 hours. I need to average about 19mph. We’ll see what happens! Mile 5: 18.7mph average. We hit the first hill. It’s short and drops my average, but I’m able to gain that back and them some over the next 5 miles! Mile 10: 20.1mph. Yeah, I like that number! On an out and back section at mile 12, I see a guy helping another fix a tubular flat and his bike is across the street! It looks like his bike needs a flat repair as well. I hope they can work together and get back on track quick. Mile 15: 19.7. I’m feeling pretty strong as I roll along the stretch parallel to Hwy 5. A lot more guys start to pass me and some from Troy’s age group…but he was in the last wave of 3 in his age group because of our last name. Mile 20: 20.2! Yes! I’ve got a good rhythm going. I’m starting to wondering if I can hold this pace for a good chunk. We’ll see. The first “no pass” zone is coming up. A few riders pass and then slow down..ugh! I have to drop back 3 bike lengths before I can pass. I drop back and then surge. I barely get ahead of them before the zone. Phew, thanks God! I ride through without anyone close ahead and can push this section. Mile 25: 19.9mph. It was a little climb getting to the backside gate of the base. Here is where we ride by the Marine barracks. I appreciate the sacrifice these guys make being out here day in and day out with few breaks. It starts to roll a bit now. I know most racers are dreading the “big hill” of the course which is a 12% grade. It will be a challenge but coming from Auburn it’s not overwhelming. As I approach, it’s a sea of riders all the way up. It’s a game of dodge and forge ahead. People are weaving, people are walking, and I see a guy just fall over. A wheelchair athlete has music blasting from somewhere on his hand cycle…pretty sweet set up! As I about reach the top, I remember my high school coach telling me to push up and over the crest of hills. I pick it up and peddle hard into the descent. I also remember Troy telling me to push the downhills when others coast. Mile 30: 19.3mph. Boy that hill killed my average but I feel confident I can make it up over the rest of the course. I soon realize that there are more hills after the big hill…I must have blocked those from memory. My average continues to drop…ugh! God reminds me that it is still possible…just under 19mph is what I need to hold. Mile 35: 18.5mph…and dropping. My hamstrings are bothering me. I’m getting discouraged with my average. The Lord reminds me that I’m wearing my FCA gear and that I need to smile and show others that I’m racing for His glory and not mine. He also reminds me of the Iron Prayer service where it was mentioned that the pain that Jesus endured on the cross 2000 years ago is nothing compared to this. If He can suffer and still encourage the criminal on the cross next to Him, I should certainly be able to smile out here and appreciate this moment. Mile 40: 18.2mph. By mile 42, the hills are over…thank you Jesus! I’m able to start building my average back up. Mile 45: 18.6mph. Getting better! About six girls I passed one at a time on the hills are now passing me as a pack! Wow! Then 2 guys ride by with the one on the back not pedaling at all…come on buddy, at least pretend you’re not drafting. I have only seen one race official today and it was miles ago. There is nothing I can do but focus on my own race. Mile 50: 18.7mph. Slowly inching up. The feet warmers are irritating my feet because they’ve been rubbing for miles. I really am looking forward to the run! Mile 55: 18.7mph. It looks like I’ll be real close to 3 hours. I’ll take it. Thank you Jesus for getting me through this! 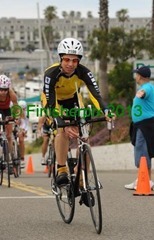 I push hard to T2. 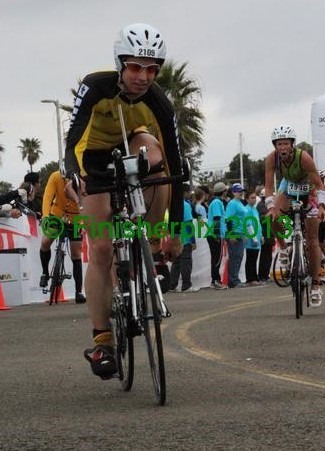 I pull my feet out of my shoes as I approach the dismount line…feels so much better! My transition is pretty smooth. I take a quick unplanned “break” at the porta potty. Once I’m on my way I feel pretty good physically but a little disoriented mentally. I almost miss the turn for the first out and back. As I run to the pier and down a ramp, I see Troy coming back. He is smiling and looks strong. We cheer each other on. I love seeing him! Mile 1 is 8:42. That’s pretty good considering my break. It is super crowded on this stretch of the narrow Strand. There are runners going both ways and cyclists finishing. I just try to make myself as narrow as possible to squeeze through. Mile 2 is 7:36. Back to the pier and up the ramp to the top and onto Pacific…an added bonus…just what my legs want. I pass T2 and go straight this time. Back down to the Strand and there is the FCA Endurance tent! I can see my Dad waiting for me and I wave and he waves back. I give him a high five as I go by…great boost! I can see the girls playing in the ocean with Grammie watching. That is way more fun for them then watching the race! Down the strand I go and then another climb up to Pacific. So far the hard pavement isn’t getting to me. Mile 3 is 7:43. Keeping my eye out for Troy heading back on his first loop. I start to get concerned a bit. Maybe I missed him somehow. There he is but it seems like he should be further ahead. “Pray for my hamstring" he says. “I will!” I know that means the hamstring he strained at the Davis Stampede 1/2 Marathon is threatening to make him walk. As we part, I pray for him. I start noticing more that my hamstring soreness I experienced at the Stampede is setting in more. Lord, please help us both continue! Mile 4 is 7:44. The course is different from several years ago. We run past the end of Pacific and up into another neighborhood. I note that the aid station here has Coke…that will be great the last few miles! Mile 5 is 7:44. I continue to feel strong but the hamstrings are starting to hamper my stride. A bit of an incline along here adds to the loss of momentum. Mile 6 is 8:00. Lord, help me to smile and focus on You. It might be getting harder but I still, like You Lord, should be joyful in my pain. I get back on the Strand and strain my eyes to see the FCA tent. Eventually it comes into view. Our “Why Do You Race?” flag is standing very tall and waving. Lord, I know I race for You and I race to persevere through the feeling of wanting to let up and even quit. I see my Mom this time but no girls…they are still playing. I still get a high five and smile from my Mom which is another boost! I get confused at the next intersection and start to go straight. I see the finish line…oh dear, wrong way! I turn around and head back. Did anyone notice? Yeah, like a hundred people probably! Mile 7 is 8:17. Back up Pacific, to the pier, and down to the Strand. Ugh, it’s like torture to the legs! The bright spot is seeing Troy again smiling. He looks good so it must be better…I hope! Again, it’s very crowded along here. I can see others are hurting and are just trying their best to put one foot in front of the other. That's why I choose not to ask anyone to move over, but instead opt to dodge and jump up (a big jump actually) onto the sidewalk. Then a guy comes barreling through yelling impatiently, “on your left!” With that kind of energy, I think he could find another way through. Okay, one last time up the ramp to the Pier, along Pacific and down to the Strand. I see Dad waiting and no girls. Another high five and another boost! Mile 8 is 8:01. Okay, I’m not totally cracking. Thanks God for keeping me going. I just need to run out and back one last time! Yeah! Mile 9 is 7:59. On Pacific, a girl comes alongside at a good clip. I pick it up and match her. She says “good pace, I’ll need you to get to the finish. We can work together.” I agree with a smile but still try to glance at her calf to see if she’s in my age group. “Don’t worry”, she says, “I’m in the next age group”. Busted! I tell her “either way, it doesn’t matter, we can still push each other”. I find out her name is Carrie. I pull ahead and she comes with me. “Great job Carrie”. Mile 10 is 7:48. Carrie surges and I struggle to match. She pulls ahead but I keep pushing. There is Troy! “It’s better” he says. Yeah, thank you God! I look forward to being reunited with him at the end! Mile 11 is 7:47. Carrie has put a good gap on me and is already heading back. “Great job Carrie!” On my way back I’m sure to grab the Coke. It’s Coke all the way back baby! It’s nice and cold…but bubbly and not flat…”burp”…”excuse me”. Mile 12 is 8:06. Ugh! This is tough! Lord, help me to press on! Carrie is now a dot on the horizon. No matter, I need to keep giving it my all! I grab more Coke at the next aid station…yum and “burp!”. I’m finally back on the Strand! The hard pavement has been punishing but I’m almost done! Yeah, finish line here I come. 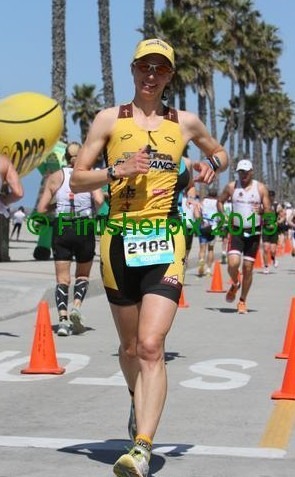 I start to worry that the girls would finish with Troy which means disqualification at Ironman brand races. I feel the Lord reminding me that He has always worked out the finish line situation…the girls have always finished with us when the timing was right and we’ve never had to pick and choose…He does that for us. I see the booth and the girls! Everyone, including Troy, is smiling and waiting. I give Anna a high five and just miss Ariel’s hand. Mile 13 is 7:57. I push as hard as my sore legs can go! 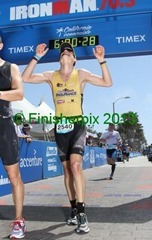 I cross the finish line! Thank you Lord! That was the best, doing that together with you! You rock Jesus! First big race of the season and I'm in a new age group, 45-49. So much to look forward to as the "young guy" in the pack. We just had a fun week in Disneyland and visiting family in San Diego. Yesterday was a wonderful Good Friday Iron Prayer service on the beach in Oceanside. To top it all off, the weather is great and the water temp is 63 deg, 9 deg higher than expected! 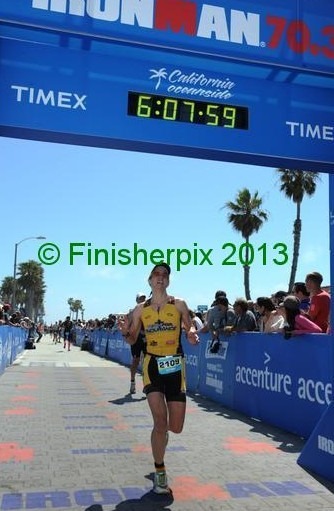 One of my prayers for this race was not to be uncomfortably cold. We came prepared with hand/feet warmers which we stick in our shoes and on handlebars to help after the cold swim. But the morning is 58 deg, no wind, and the water is warmer than normal. Thanks, God! Robin and I arrive on time, set up T2 near the pier, and pop up the FCA tent on "Tri Club Row". One of the race director staff helps with the tent and encourages us to go on and get ready. The race staff has been very supportive of FCA Endurance. We ride over to T1 and set up. Thousands of bikes and athletes. I see my old training buddy, Jeff Fieldhack. It's been years! Hopefully I'll see him on the course. This race is a huge deal. I get concerned when I come back from a warm-up run / bathroom trip to find the transition closed. But I find my way in and Robin and I meet up with wetsuits and do our final preparations together. It's calming to be together. Best friends racing an IM70.3… and the grandparents have the kids! This doesn't happen often. We pray together, encouraged to focus on Christ, the perfector of our faith, during the race, no matter how difficult it gets. Robin heads off to her wave which is 4 ahead of mine. I line up in the "orange-cap" 40-44 group. The last wave. I didn't remember I had a yellow cap on. Guys keep coming up asking me where the "yellow-cap" wave is. I tell them it's probably way up there and wonder why they're asking me. After 10 minutes I comment to the guys around me, "wow, they put us old guys in the last wave". They say, "Yeah, but you're 3 waves up". Doh! Hope I didn't offend anyone. I go find my wave. It's 7:30 and I pray for Robin as her group of ladies takes off in the swim. I hope she feels the Lord's comfort and strength out there. 12 min later, I'm jumping into the cold water. Ugh, a terrible feeling but I know it wears off after a minute. We're lined up. I'm on the outside. Go! I feel great starting out. I'm surprised to be ahead of the line to my left. I know it won't last but it's encouraging. My goggles start getting impaired with water and fog. I take in some salt water from splashes. Gotta stay calm. I find a draft and try to keep behind him. Easier watching him than looking for buoys. We go by many swimmers in waves ahead. Now swimmers start passing me. It's going well. Soon enough we're making the far turn at the mouth of the bay where the swells get a little bigger. My draft guy is erratic. I have to continually change path to stay behind him. Still better than going on my own. Around the final buoy, heading back. I get kicked in the lip. I think it was a woman. Whoever it was, they had a good powerful kick. I couldn't see well to stay out of the way. I'm ok but feel my lip getting bigger. I can't see the buoys so don't know where the end is. I just try to swim fast and hope to get out soon. Arms are tired, body getting stiff, and drinking too much salt water. I desperately keep an eye on the yellow cap I'm following. He weaves around other swimmers. 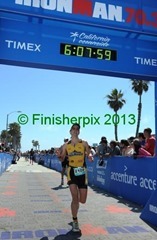 Finally the finish line barely appears and I head for shore. I'm glad to get out. Long run to transition. Slower runners ahead makes the pace slow. But, nice thing, I'm not feeling cold! I put my FCA jacket on (a long frustrating process) but am thinking I don't need it. But I "stick to the plan". 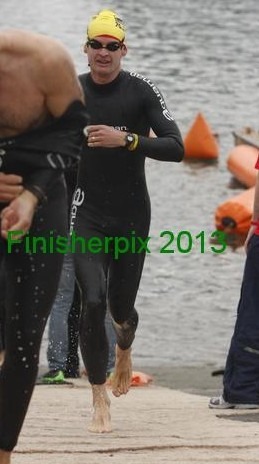 Again I thank the Lord for letting me not be cold after the swim. The Bike I start cruising through the cool morning air. I realize the jacket is nice to have. The toe warmers feel good. Hand warmers aren't really needed. Mile 5: 20mph. The road and path straightens. We have a tail wind. I should be going faster than I am… probably need to loosen up. I wonder how close I am to Robin now. Mile 10: 22mph. At the first out-n-back section I expect to see her but don't. Did I pass her and not realize it? The bike path takes us North along Hwy 5. This is the good part. I feel like I'm doing well but every mile another guy flies by me. Mile 15: 22mph. I think about my ride with Shayne a week ago. 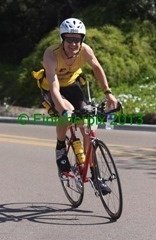 I felt comfortable and strong on my tri bike. I try to get that same feeling now. 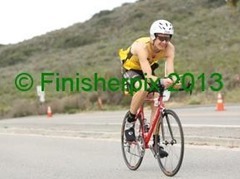 I try to keep my head still and imagine my aero helmet cutting through the wind. This is the longest straight section. Mile 20: 22.1mph. I'm drinking Sustained energy and take a Perpetuem solid. A 65yr old guy passes me, then settles back, multiple times. I let it slide because, hey, he's 50% older and beating me! I take off my jacket already. Thanks, Lord, for great temperatures. We hit the 1st no-passing, narrow section. I strategize it well, get some rest, and take off at the end. Christianitos Rd now heading into the Camp Pendleton hills. I've been looking forward to this.. maybe just to change things up. Or maybe because my "flat" riding hasn't been that great so I'm going to focus on pushing the "climbing". Mile 25: 21.8mph. Doing well in the hills. I enjoy looking at all the military training grounds and the marines volunteering for the race. We climb a steep grade at 28.5mi and then head towards the "dangerous" descent no-passing zone. I strategize it well and pass others before I enter. Just after entering the zone, a woman passes me on the right saying, "I need to get ahead, there's a no passing zone coming up". It was kind of funny because of how many rules she broke all at once. Mile 30: 21.2mph. I still haven't seen Robin. I'm starting to slow a little, getting tired, feeling the wind. Then I see her climbing a hill ahead! It motivates me to try harder. I pass many riders on the hill but don't really gain on Robin. I make up some ground on the descent but again can't catch her on the hill. Wow, she's doing great! Finally I catch her and I wish we could just ride side-by-side for a while.. but the rules won't allow it. An exchange of smiles and encouragement will have to do. Mile 35: 20.3mph. Knowing Robin is behind me helps me ride better. Seeing my average drop below my 20mph goal also has me pushing harder. I just have to get through the hills… but the last 10mi is hard, too. It's always a head wind. I'm dreading knowing I'll have to give it everything I've got there to keep my speed. Mile 40: 19.9mph. Ugh. Will I be able to get back to 20mph? It's windier. The hillsides are beautiful. I'm not hurting much on the climbs. I focus on passing others. Finally, the top! As we start down, I see 2 guys drafting another. The lead guy is pedaling all out while the 2 guys are just coasting in his draft. Pretty obvious. I catch up, making a big effort to get past them. I tell the lead guy there's 2 on him. He isn't happy to discover that. The extra push to get passed them and the long downhill got my average back up.. Now it's time for the dreaded 10mi finish. Mile 45: 20.4mph. Wow, that was a great descent. 44mph. The 2 wheel suckers have fallen back. The fast guy and myself aren't far from each other. We're working hard. All the way back to the base we keep seeing each other. He says, "If we lived near each other, we could train, we're similar ability" It makes us both push harder. But my main motivation is how exciting I am that there's a tail wind instead of a head wind! I feel fast and am working to pass everyone ahead. This is terrific. I'm actually increasing my average instead of losing it. Mile 50: 20.7mph. looking forward to being done. Just keep pushing. Getting more windy now. I ease up a bit as we weave through intersections, through the base and into the harbor. I'm happy about my ride and don't mind losing a little time now to prepare well for the run. Mile 55: 20.6 mph. We see the runners along the beach. I drink the rest of my fluids. My bottle cages on the back are almost falling off but I didn't lose any bottles. The ride went well. I drank well, pee'd twice, didn't get a sore seat and wasn't cold. Thanks, God. The RunReally looking forward to the run. After a good transition, I grab sunscreen from a table on the way out, applying it as I go. Sunburn is always a problem after the wetsuit rubs off initial sunscreen. I'm thankful more was available. A U-turn and I'm on the new run course. Looking forward to checking it out. Down onto the pier and a steep descent to the strand. The course is already crowded with the 16 waves ahead of me. But the pros are already done! Mile 1: 7:19. Back up the steep part to the pier, along the top and down a steep rode to the beach Strand. I run by Robin's Dad, Gerry, at the FCA-E tent. I see Greg Price, our generous Home Stay provider. My hamstring is suddenly starting to hurt. It's the twinge before it goes. It's a serious concern. At the Stampede a month ago it started like this at 10mi and I was walking at 12. Mile 2: 7:46. I look for a spot to stretch and find one. Although it didn't help at the Stampede, I still want to take care of it best I can. Wouldn't you know it, Coach Muddy Waters just happens to be nearby. He comes over to give me advice and encouragement. Amazing how he is always at the critical spots on a course. He's a great coach that we came to know over our years in San Jose. I tell him I feel good, just have to wait on the leg to feel better. After 40 secs, I'm off again, at a very controlled, careful pace. Looking down the road, across the many athletes, I remember some great and tough times on this run course. Running as fast as I could and trying to stay cool in the heat. Today the temperature is great and this easier pace makes the run seem so doable. But I'd rather be gasping for air than wondering when this twinge in my hamstring is going to explode and render me helpless. Everybody has something they're struggling with out here. Whether it's the obvious of being paralyzed and racing in a wheelchair or running on prosthetics without legs. Or nagging training injuries that are now making the race miserable. Or just racing hard trying to find your self worth and having the frustrating feeling that it's not going to be good enough. Whatever it is, the hard part is that no person can help you out here. I want to know what to do to help my leg, to keep me going. I do have help. It's so comforting to know the Lord Jesus is with me always. I immediately go to Him in prayer. I feel like He's telling me, "the nagging twinge is a reminder to have faith in me. You'll be fine to the end if you focus on me." At the Stampede the twinge turned to full-blown muscle pull in less than 2 miles. It doesn't make sense, but I believe God. Now I just have to look to him every time I feel pain in my leg. Mile 3: 8:01. Good considering the stop. Now on the cement section of road. Always feels harder and hotter here. Down to the turn. Backtrack along the houses. Careful around the U-turn cone. All the while remembering, "look to the Lord, He will take care of the hamstring, I will get to the end, I have no other help but Him and He is sufficient"
Mile 4: 7:46. Get lots of water at the aid station. Back around the street corner. Up the gradual climb. I like the climbs, I can push a little harder. Climbing shortens the stride, strains the muscle less. But the hamstring can still go any mile, unless I keep my eyes on Christ. I see Robin running well the other way. We both smile. I ask her to pray for my hamstring. I've been praying for her race and am glad every time I see her running well and looking strong. I also see other FCA Endurance and familiar faces on the out-n-back course. Mile 5: 7:46. It's a longer way back than I thought. But soon I'll be on the beach Strand seeing family. I'm looking forward to the 1/2 way point. I'll start taking gels then. Mile 6: 7:56 On the Strand now. I can see the FCA-E tent a long ways off. I get waves of encouragement when I go by. Now up the steep part, slowly, but still running, to the street above. People are finishing down below and some just starting on the course up above. Down the pier ramps to the Strand again for an out-n-back to the aid station. Mile 7: 8:15. I take a gel and water and am feeling motivated to head South again.. for the last time. The hamstring is staying exactly the same but I'm trusting God every mile that it will last. Sometimes I want to go faster, sometimes slower, but I try to just maintain and trust. Going up the ramp I see Robin, closer than last time, "You're gaining on me!" I hope that encourages her. She looks like she's having to push harder now. By the FCA-E Tent again. Robin's Dad is keeping a close eye on me and Robin while the girls play on the beach with Grammy watching. Mile 8: 8:35. I start reciting Ps 23, "The Lord is my shepherd, I shall not want. He maketh me lie down in green pastures.." Oh how nice that would feel to finish and lay down on some cool grass. It takes me quite a few tries to remember most of the verses. Each 1/2 mile I start over. I think about each verse and it's application and how good and important the Lord is to me. It's not easy diverting energy to remembering the verses while trying to push through fatigue at the same time, but every mile without hamstring-shutdown is so rewarding. Celebration is coming. I look at my watch and am surprised to see a low time, like I'm going to finish way below 5 hrs! Even though my last mile was my slowest yet. Perhaps the mild wind, the good swim, the flat, steady-but-surely run is adding up to be a big surprising 4:30 1/2 Ironman! But I don't think about it much because math is too hard right now. I just focus on God and keep the running form together. (after finishing I realized I was looking at the wrong time on my watch which didn't include the swim). Mile 9: 8:23. Up to the cement section and down to the street corner. I can't wait to make the final turn-around. Mile 10 will mark the spot where my hamstring conked out at Stampede.. but today I feel like it's going to be the spot where it feels better and I pick it up. Mile 10: 8:10. Splits getting better. I make the final turn-around! Heading back, grabbing my gel, I drop it! Just like at Stampede. But this time I let it go and don't risk hurting the hamstring bending over. I take a different one. I thank God for His faithfulness in getting me to this point and I feel it's time to push it now. I slowly pick up the pace. I look forward to seeing Robin. Mile 11: 8:13. There she is! Closer than the last time we passed. I'm so glad she's able to pick up the pace. I tell her the hamstring is feeling better. I'm motivated to charge these last couple miles. I start taking Coke now at the aid stations, yum! My friend, James Player, who started 3 waves behind me, comes up on me. "Bring me home, Troy". This is so great to be able to run together. We weave in and out of other runners. Mile 12: 7:41. The faster I go, the faster he goes. I encourage him on the last climb and to look forward to the rest on the final descent. Careful going down… Now it's a straight shot to the finish. I'm pushing and the hamstring is feeling great. Legs, knees, everything getting more sore but just feeling the motivation, the strength, the excitement, the enjoyment of racing the best I can. Having James to work with is helpful. The Lord always knows how to make my race exciting and I feel it's a reward for looking to Him every mile in faith when I didn't know if the hamstring would last. This is a great! Finish line right ahead, the team tents on the beach, Robin's family cheering from the FCA tent. Mile 13: 7:01. James falls back a little. Another guy comes along side and we both sprint. People are cheering. I feel no pain, just fatigue now, but am so happy for what God has done is letting me run my fastest at the end, letting me feel good about having given a great effort. I know it was a real possibility of having to walk much off the course. But I'm finishing, running, with a big smile and pointing to God. I'm so glad to be done but even more thankful for what God has done. That's the lasting memory I'm grateful to have from this race. The first multisport race of the season, so of course I'm feeling rusty and looking forward to getting a lot of transition practice in this run-bike-run-bike-run event. It's a beautiful day. I ride 10mi to Granite Bay, which is mainly down-hill, so it's a nice warm-up. The transition is very small as usual for these early season TBF races. No pressure, no stress race. I see Dave, his son-in-law, Steve, and his wife, Francie, volunteering as they do so often. The TBF Racing owners are working hard: Mark is announcing and Bill is running around race directing. Soon our friend Rich Alesci finishes the 1/2 Marathon with Leonie and their son, Reed, meeting him with loud cheers. And then our teammate, Karen Nickel, also finishes. It's a tough trail run and they both did great. Our girls run over to see Leonie, she's always great fun to see at races. I do my warm-up run and drop the kids off at the "hot corner" where they will be "helping" Dave and Steve direct runners, biking, cars where to go. They've got their chairs so hopefully they'll just stay out of the way. They're great sports. Robin & I line up together. We see our friend, Jody, and join together to pray for the race. Most of all we want to compete for Christ, setting a good example and aiming to please Him over just going fast. My goal is to take the first 2mi run loop easy and pick it up each one, hopefully negative splitting the last one. The bike… just go hard. Go! It's a nice straight-away start along the beach before it goes onto the single-track trails. A 1/4 mi into it I'm 13th. Some are way ahead. Wow, they're starting fast, but I'm sticking to the plan. It's a fairly flat loop, easy to follow and fun twists and turns. I get water and every opportunity. It's a warm day after months of cold. I come into transition in 9th. I fly by the girls and they cheer, and Dave, too. I like this course, it's technical. 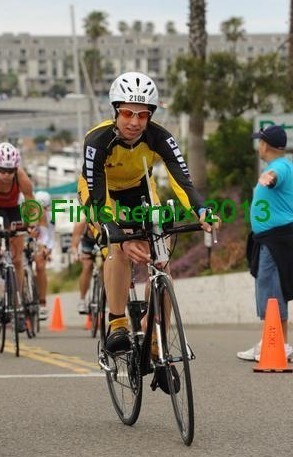 I'm riding well and feeling comfortable on the tri-bike.. which I haven't ridden much lately. I only have a couple sharp turns which I don't take perfectly. I pass a couple guys and go back and forth with one for a while. I try to take advantage of every corner, taking the best lines and also focusing on the 180-turn-around. It all goes great and I push the last 1/2 mi into the wind to coast down into transition.. after another great cheering from Dave, Steve and the girls. After the bike I'm in 6th. This run is feeling hard right out of transition. I'm next to a guy that's pushing it pretty hard. I pass him on the downhills and he passes me on the up and jokes about my long legs being great for down but he wouldn't want to lift as high as I have to on the ups. We talk as we wind through the trails. He's in the next age group up so he says now we can push each other without trying to kill each other. He's running well but I'm feeling really good about the plan and motivated to push myself. 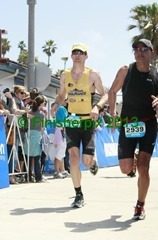 I take a Hammer gel and pull ahead at the 1/2-way aid station and finish a good distance ahead of him and in 5th place. I hope to match the first bike effort. It was a good one. I know the sharp corners well now and take each one perfectly. I'm looking for the leaders. There's 2 far ahead and then I see 3rd place.. but where did 4th place go? I see Robin heading out and she gives me a wave. So great to be able to race together.. I really look forward to seeing her smile when we pass, and knowing she's having fun and doing well. Coming back to transition, Dave gives me the number 4 for 4th place. Somehow I'm 4th. Well, that's good. It's nice knowing this is it, I can give it my all. I think it's a negative split effort. I look to the 3rd place guy, quite a bit ahead, but I still go as hard as I can. Still getting water each time. I tell one of the volunteers to cheer for Robin when she comes by. I'm finishing strong and really happy about my effort and performance today. I'm thanking God for letting it go so well for the first race of the year. Transitions were good, equipment worked well.. great experience! I finish in 4th, and 2nd overall for the individuals. The first 2 guys were part of relay teams. I gather up the girls and we put ourselves in position to cheer for Robin. I'm surprised to see another woman already at the finish line… a few minutes before I would have expected the top women's time to be. And there's Robin. Anna runs with her and then Ariel jumps in… almost getting left behind.. but then picks it up and they all finish together. The other girl had somehow made a mistake on the course missing a few miles so Robin was the winner! Robin biked home as a cool down and I ran with the girls on their bikes for my cool down. We went all over the mtn bike trails by Granite Bay and had a great time… we lost track of time and came back to see everything packed up and gone… including my bike almost. The race directors are great and stashed it for me. Thanks God for a great family day! Today Troy and I get to test our race readiness and transitions. I’m hoping that my breathing difficulties that started from a cold at the beginning of the year have been finally put to rest. The girls and I make the short drive down to Granite Beach while Troy bikes down. As we pull into the park, we see Karen Nickel running the 1/2 Marathon. “Go Karen!” She smiles. We then park at the race site and cheer some more as she runs by again. We run into my college roommate, Leonie Alesci, and her sweet son, Reid. Her hubby, Rich, is racing the 1/2 Marathon, too. Troy arrives and I get my transition area set up alongside him. In the meantime, Troy takes the girls over to hang out with our buddy Dave who is directing car and bike traffic. They are armed with pom-poms and a cow bell to cheer on all the athletes. Troy and I get to the run start. I don’t feel I got myself an adequate warm-up but this race is so low key, I’m not too concerned. We run into FCA Teammate, Jody Galvin, at the start. We all take a moment to thank the Lord and give Him our focus. Just seconds before my race I notice I left my Garmin watch on my bike. I chuckle to myself and think “rookie move”! I have my backup Timex that should work on this first leg. God is in control and this is not a big deal. Ready, set, go! The group takes off fast. I see Troy near the front and a few girls up with him as well. I’m feeling great and for the first time in a long time can breath well while running fast. Thanks, God! I’m able to pass the girls and put myself in the top 15. Leonie is out at Mile 1 cheering me on. She is the best supporter one could ever ask for, hands down! I get a minor bloody nose on the way back and do my best not to get it all over my yellow uniform. It’s a pain but I’m getting pretty good at stopping them. I’ve got a water bottle at my transition I can use to rinse off any remaining blood. I get to my bike clean of any remaining blood. Hopefully I didn’t scare any spectators on the way. My transition is a bit slow but I finally get going! As I head out on the open road, I get to see our girls and hear their cheers. On the furthest part of the course is an out and back. On my way back, I see those 2 girls I passed at on the run. My average mph is close to 19mph so I make it a goal to hit that on the way back. There’s one more short out and back and then I’m heading in. I see another girl close behind now and it motivates me to push harder. 18.8, 18.9, 19.0, 19.1…thanks Jesus! I pass by the girls as I come home to transition. I can tell they are having fun exploring as they hardly notice me as I go by. I’m looking forward to running and hope I can feel just as good. My transition off the bike is smooth but running this time around feels much harder! I just try to latch on to a few guys ahead of me. At Mile 1, I start to feel better and I’m able to pass those guys. I also have a Hammer gel which also helps give me a boost. I am so thankful that this course is relatively flat and short. Mentally that is a big boost as well! On my way back I can see that woman who was close on the bike. She looks strong and is not too far behind. 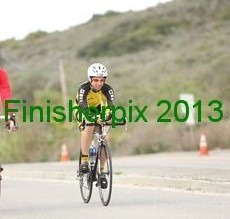 I push harder in hopes that I can keep a good gap on the bike. My transition onto the bike is much better! I’m off and say hi to the girls and Dave on my way out. Okay, let’s try to average 19mph or more this time! Soon it is very clear that that will be difficult. Again, I underestimated how I was going to feel. There are fewer riders around me so I don’t have as much motivating me to push hard. Lord, help me not to be discouraged but grateful for the effort I can put out. On the backside of the course I see that woman again. She’s closer this time around so I know that I need to keep pushing. My average is around 18.5…I’ll take it but keep trying to bring it down. I only see one of the two girls that I passed on the first run. I’m pretty certain I’m the first woman which is cool…thanks Lord! On the last stretch of the course, I can see that my average is 18.8. Alright, not bad, I’ll take it! As I ride past Dave he tells me I’m the first woman…cool! I say hi to the girls but this time they are so engrossed in exploring that they don’t even acknowledge me…I’m glad they are having fun! This is it! I just need to go 2 more miles! I feel much better this time around though not as good as the first loop. There is a guy to chase and of course motivation to stay ahead of that woman chasing me. I am able to pass that guy and see another one. At mile 1, I get some sport drink and then set out to catch that guy. I see that woman again and this time she is farther back but still looking strong. As long as I don’t slow way down, I should be able to hold my position. This guy is hard to catch! My hamstrings are really getting sore now so I can’t move as fluidly. I try to run with good form and push off harder with each step. I wonder if the girls are going to finish with me. I forgot to tell Troy to bring them over to the finish. Well, I’ll soon find out. I make it to the long home stretch and I’m closing the gap on that guy but I it will be tough to seal the deal. Soon I see Anna…yeah! I push hard to her and grab her hand. Ariel is further down the road and I tell her to start going. We catch up to her and I grab her hand too. We finish together with smiles on our faces. We never catch that guy and it doesn’t matter…this is the best!